I haven’t. They seem a disappearing species.Like the dodo. Sad. I checked. Greyhound—now more than a hundred years old—is still in business. A decade ago, it had some 3,500 buses on the road. Now, it’s down to less than half that. Corporations are like you and me. There are up’s and down’s. Good things happen. Bad things, too. Why am I telling you about this? I rode Greyhound a lot. I loved Greyhound. Many trips, including several clear across the count from the Atlantic to the Pacific and back. Many thousands of miles. “Leave the driving to us!” Greyhound says. We’ve all heard that slogan of Greyhound’s. This beaut was the model that I usually rode. One of Greyhound’s biggest innovations over the years was a nice, clean onboard toilet.What a much appreciated difference that made. Often I did leave the driving to Greyhound. My first cross-country on it was in 1995, I believe. Greyhound offered a sensational transcontinental ride for $99. I bought a ticket thinking of the grand adventure it would be. And I loved the price. Plus I had a reason that made that bargain irresistible. My son Mark was studying at the University of Washington in Seattle. I missed him. I hopped on a big, shiny Greyhound at the New York Port Authority terminal in Manhattan. And it was three days to Seattle…day and night plus a few hours more. In a way it was like the old Pony Express mail service from St. Louis all the way to California. It was the same rider all the way.The rider would change horses after every so many miles. Ad keep going and going. I said in a way. On Greyhound, it was the same bus all the way, but with a different driver taking the wheel after every shift. The hard part was the nights. Trying to sleep was a nightmare. 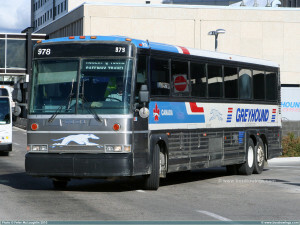 Once, I rode Greyhound across most of Canada from Vancouver in British Columbia on through Alberta, then Saskatchewan, then Manitoba and Ontario, right across to Montreal In Quebec. By the way, those Canadian Greyhounds towed a beautifully matching trailer loaded with parcels. A trailer with the same paint job and same doggie logo! Another time I rode Greyhound deep down into Mexico right to huge Mexico City. Actually it was a Mexican bus line that partnered with Greyhound. A great ride. I even rode a Greyhound, yes, a Greyhound on a visit to South Africa. Greyhound also operate in Australia, well, it did back then it did. I never made it to Australia. On all these trips, passengers kept getting on and off. Just a few would do the whole long distance. By that time, we recognized each other and felt a special bond. We’d say “Good luck!” to one another and “Take care!” Even if speaking to somebody who didn’t understand English. They got the gist of it. Sure, there were bad moments. Once Greyhound took off and left me behind! Stranded! We stopped in a small town in Oregon, 20 minutes for a coffee and toilet brake. I had been sitting behind the driver. The seat next to me was empty. I left my jacket and a handbag on it. Across from me were two elderly ladies. We had chatted a few minutes. I rushed back inside to the Greyhound agent. He gave me the phone number of a taxi outfit. I called. A taxi would be on its way. It took forever. The driver was a lady in her 60s. She had a boy in the front, her grandson. I explained. I hopped in. I worried all the way. Why didn’t she step on the gas! Finally we made it to the restaurant. I spotted the big Greyhound. Good! What a relief. I paid her. Included a tip though she didn’t deserve it. Rushed inside. The driver was sitting by himself at a table. He was starting on his apple pie and coffee. He saw me come charging in. And he leaned back ramrod-straight. I was so pleased to hop back on. My stuff was still there. I would have had to stay overnight … 12 hours … for the next bus. I showed him the receipt I insisted on from the taxi lady. He whistled. But opened a drawer and paid me the money. Oh, boarding a Greyhound to start your trip, you leave your suitcases by its side and a luggage clerk gives you a receipt and stows them in the baggage compartment under the bus. Twice I had luggage lost. I eventually got them back. Once it took a full month. All that said, overall my Greyhound travels were satisfactory. I think highly of the company. l must tell you I didn’t ride Greyhound exclusively. Back then I also had my great little VW microbus¸ and I put thousands of miles on it—always solo, by the way. Anyway, one day I wrote up all this Greyhound travel of mine and the Christian Science Monitor Magazine bought it. I thought you might enjoy it. I managed to dig it up and here it is, complete. It was published in the issue of February 12, 2001. I have three children, adults all, and they live in Florida, California, and Washington State. I like to go see them, but my mode of travel worries them. It also bothers my friends. They speculate about me, and frown. I live in the Northeast, but I don’t travel those great distances west and south by airplane. I take the bus. I have the time, and I like seeing the country. Now I’m on my way to see Mark in Seattle. It’s 6 a.m., before dawn. We’re in Oregon, but I can’t make out the countryside. I love these early hours. The bus is dark, and everybody else is asleep. I feel meditative. I left home a month ago. I stopped to sightsee in Philadelphia for five days, then eight days in Washington, D.C. – wonderful. Two days in St. Louis, a week in Dallas. Then a long leg – nearly two whole days – to Los Angeles. Finally, five hours up the coast to beautiful San Luis Obispo, Calif., for 10 days with my daughter, Monique. I don’t get bored. Honestly, I don’t. I look out the window. There’s lots to see, even on prairies or deserts. I read. I write. I talk with my seatmate, if I have one, though I prefer an empty seat next to me. Or I talk with the driver, if I can. I like the drivers. They’re helpful, and excellent at what they do. We’ve had three women drivers on this trip. We have one right now. She’s short, but she handles this big baby easily. I’ve been driving 50 years, but I’ve learned many of driving’s finer points by observing bus drivers. No spurts of speed, no sharp braking, no lane-hopping, no tail-gating. Anticipate. Anticipate. In the past four years, I’ve crossed the country four times. Last year I made a complete circuit of the United States – some 13,000 miles in 75 days. A small, pleasant adventure for me. “Why don’t you fly?” people ask. I do. In the past 12 months, I’ve flown across the Atlantic six times. “Why not ride trains?” I’ve ridden trains. Once I rode a train for 37 hours straight across India, from Madras to Delhi. A few years ago, I rode the rails into Los Angeles. For an hour before pulling into the station in L.A., all I saw were the backyards of houses, factories, and vast railroad yards. Not the prettiest real estate in the City of Angels. I’ve never found a train that could take me into the small towns and maybe right up Main Street, to let me size up the place through windows in front of me, and to my left and right, the way I can on a bus. Because the bus is so high, I can even see over the SUVs. In Sacramento yesterday, we drove right up the beautiful main drag. The impressive State Capitol was straight ahead. What a sight! And I’ve never found a train that could take me high into the mountains, then down into a lovely valley, with splendid views all the way. I have a double reason to travel by bus. I want to get to my destination, of course. But I also want to enjoy the trip. Remember the old saying? “To travel hopefully is better than to arrive,” said Robert Louis Stevenson. Like him, I want to see everything. Cities and towns, farms, ranch lands, forests, and ocean shores. I’ve taken the bus to many big cities: Baltimore and New Orleans; Phoenix and San Diego; Vancouver, British Columbia; Chicago; and many others. I’ve seen smaller cities like Tulsa, Okla., and Tallahassee, Fla. I’ve seen Annapolis, Md., El Paso, Texas, and Coeur d’Alene, Idaho. You’ve probably heard of them. But how about Seal Beach, Calif., and Roseburg, Ore., Butte, Mont., Las Cruces, N.M., and Lubbock, Texas? Or Lake Charles, La., and Kalispell, Mont.? I’ve seen all of these, and many more. And I’m very glad I did. I’ve seen the Ohio, Mississippi, and Colorado Rivers. I’ve crossed the Great Smokies, the Rockies, and the Sierras. I’ve ridden through the Great Plains and the Mojave Desert. I’ve seen the vast lettuce fields outside Yuma, Ariz., and the huge strawberry fields on the central coast of California. I’ve seen huge wind farms, with their countless great turbines – the power-generating technology of tomorrow. I believe I’ve seen something else. Something more important: I’ve seen what the United States is today, and what it is becoming – a smorgasbord of races, nationalities, religions, and lifestyles whose diversity is richer than ever, and assuredly becoming even more so. Surely we’re the most multi-everything nation the world has ever seen. And yet – and this is interesting – we all seem to like hamburgers and French fries…. It’s been good to see all this through my own eyes, rather than through television, newspapers, or the movies. I’ve been able to reflect upon it, to feel current with what’s happening. In a small way, I see this incredible mix right here on this bus, skewed as it is on the scale of income and social scale. After all, who rides the bus? Minorities: African-Americans, Latinos, native Americans. People without much money: college kids, young military personnel, single mothers with children, and a few seniors like me. Sometimes on these trips my white skin makes me the minority. This was a shock at first. Now I’m comfortable with it. The bus service isn’t perfect. For food breaks, too often we stop at a greasy spoon. And it’s always a shock to pull into a terminal at night and have the driver snap on all the lights and bark, “Service time! Everybody off. We have to fuel and clean this thing. You can get back on in 45 minutes.” Try that at 3 a.m. Bus travel has an image problem – it’s not cool. Some of the terminals are terrible, and I had a piece of luggage stolen when I was in Washington, D.C. People on the lam, in movies and novels, often ride a bus. And how many felons who have finally been paroled are handed an airline or train ticket on their way out the prison gates? But I still have great respect for the bus companies I’ve used. My experiences with fellow passengers have been good. I’ve had countless pleasant encounters. I’ve met wonderful people, people I enjoyed and wished to know better and longer. Another thing: I’m no longer fearful – automatically fearful – of others just because they look different. Or because they’re strangers. Bus travel has been a grass-roots lesson in tolerance. And in the U.S., at the dawn of this new millennium, isn’t that a good thing? P.S. It turns out that Greyhound is doing better than I thought. It has a number of bus lines in its stable operating under different names. So its total number of buses may be as high as it was back in my time. And its buses, by the way, are far more comfortable. More leg room. Leather seats. Air conditioning. Every seat with a wi-fi connection. But one thing makes me sad. No longer can a passenger up front speak to the driver. Which I enjoyed and tried to do whenever possible. Now the drivers are screened off by Plexiglass, or something like that. Drivers at the wheel have been attacked by crazed passengers! But one big change. The Greyhounds often no longer ride right downtown in smaller communities. They dart off the Interstate and leave off and pick up passengers quite distant from downtown. You see less of the place. I don’t like that.